IROKO Stress Busting is a flexible programme that gives the option of participating in drumming, or as we call it Jembelody workshop, or relaxing art and crafts activities that can help keep staff worries at bay! 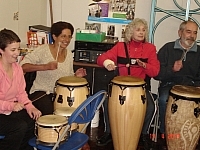 Stress Busting Jembelody (SBJ) uses hands-on traditional African drumming, mostly Jembe (djembe) drums, chants, songs and movement to help participants ‘drum-away’ the symptoms of stress in the workplace. Creative Stress Busting workshop introduces participants to the joys of clay modelling and/or batik making. The workshop gives participants the opportunity to create their own unique designs and patterns on fabric or make objects like statuettes, masks etc using self-hardening clay. Art work produced by the participants are taken home by them to admire and cherish! IROKO can provide all the materials needed for this workshop e.g. fabric, dyes, wax, crayons, pencils, burners, protective clothing, etc.